A sweet friend of The Littlest Way wrote the other day asking for a recommendation for daily affirmations as she battles cancer. Oh my heart. She has been on my mind since. Every time I read my Bible or come across a passage of scripture I pay close attention, wondering if there is an affirmation in there. I emailed her back the other day letting her know I would be writing a post containing these affirmations. My daily affirmation habit has gotten a little flabby lately so I could sure use the reminder. When I say these affirmations are for illness, please know, not all illness is physical. These affirmations could be used in any illness–terminal physical or wearying day to day–both can take their toll. And just as I would never judge someone suffering the effects of cancer, my heart is tender for those struggling with any illness at any time in any way. We each carry our own cross. There was a time I asked for a physical illness just so I could get relief from the mental and emotional illness plaguing me. But that’s another story for another day. I consider that my sufferings right now are not worth comparing with the glory that is to be revealed to me. I am God’s temple and God’s Spirit dwells in me. God did not give me a fearful spirit. The Lord delivers me from all my fear. The Lord is with me wherever I go. God has filled me with peace and hope. The Lord’s plans for me are good. Jesus has given me peace, I am not troubled or afraid. God will give me rest. I fill my mind and choose to think on the true, honorable, pure, just, lovely, commendable, excellent and praise worthy things of God. I’m going to make a suggestion here. Please, do not just print these off. Copy them into your own hand writing. Copy them on one sheet if you want, but I have a better idea. Copy them on 3×5 or 4×6 cards, one verse a card. Hole punch them and place them on a ring (here’s a spiral bound set of note cards, and here’s a set of two small ones on rings–one for your purse and one for the kitchen sink?) or use something like the scripture memory system we use. Don’t just read these verses, memorize them. 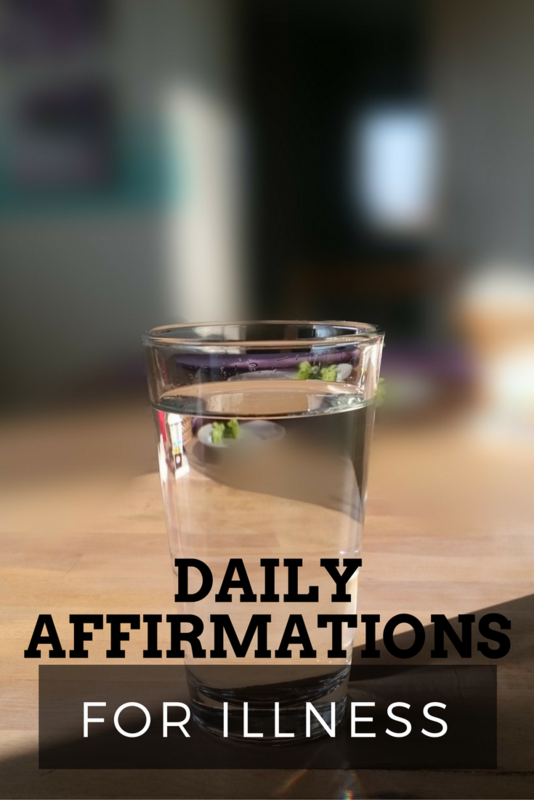 What if you don’t have your affirmations with you? What if it’s dark and you don’t want to turn on a light? What of you’re too sick, tired or just D.O.N.E? If you memorize them, you will always have them with you, no matter what! And…memorize these affirmations with scripture notation. Please with scripture notation. I want to you to know, and I mean KNOW, that these aren’t your words or my words. These affirmations are The Word–the living and active Word; scripture notation, please. I would love to see pictures of your daily affirmations. Link in the comments or email me a picture. Thank you so much Jenny! Even though they sound very familiar to me, I never memorized them, but I will now! God Bless you and your family!! It takes me longer to memorize than my children, but the payoff for even having one simple verse is amazing! Thank you for the encouragement to actually memorize and for me the “writing” it out. When Luke 6:45 popped into my head yesterday, I was forever grateful. “For from the fullness of the heart the mouth speaks.” Dear God, fill my heart because you know I speak ~ a lot! Okay these may not be The Word, but the words of His mother and along with the daily readings of the church, they are where I found my affirmation today. I sent that quote to my mother in law when she was first diagnosed with cancer. Thank you Michelle. Wow. Do you believe that? Divine Providence there.